Print your photos on glass to make attractive an all in one printed glass frame. Printing photos on glass give the images a unique lustre, crisp detail and vibrant colour. Glass printing is a rare skill, which we use for our luxury printed glass gifts. Next day delivery options available. Transfer a favourite photo to glass on our personalised glass photo frames. Photo printing on glass is unusual and rare, so why not create something different with clear glass photo frames? It looks terrific and makes a great glass photo gift. Our process of printing photos on glass is called dye sublimation printing on glass. This means we print directly into a coating on the glass and do not supply laminated paper prints that stick on and peel away in time. Cannot express how pleased I am, the quality was fantastic, the product is cheap, it came quicker than I expected and it made my mum over the moon ! Ordered one day arrived the next. My print was perfectly aligned and they jigged it about to make sure everything was in the frame. Very pleased with quality, service and product. Being experts in personalised gifts you can expect us to have a great quality personalised photo glass gift. It's a luxury item that looks handsome in any home. Glass competes with leather for the 3rd wedding anniversary, but here at Bags of Love, you can get both as we do leather (key rings, passport covers, iPad cases) as well as this smart glass print photo frame. Is it photo in glass or photo on glass? Hard to say because the picture and the glass are now one. We fuse the image into the glass for a glass photo gift. It is definitely not a paper print sandwiched between two parts, nor is it a paper print stuck to the glass. This is one piece of glass, with a photo integrated into its own body for a new level of surface decoration. Toughened glass print frames mean it's great to be able to make a special photo even more spectacular by printing it to the glass as a quality gift for someone. Coming in a tough mail pack you can safely send the present to a family member or friend far away, and give them the pleasure of a great photo and a unique cool glass gift. 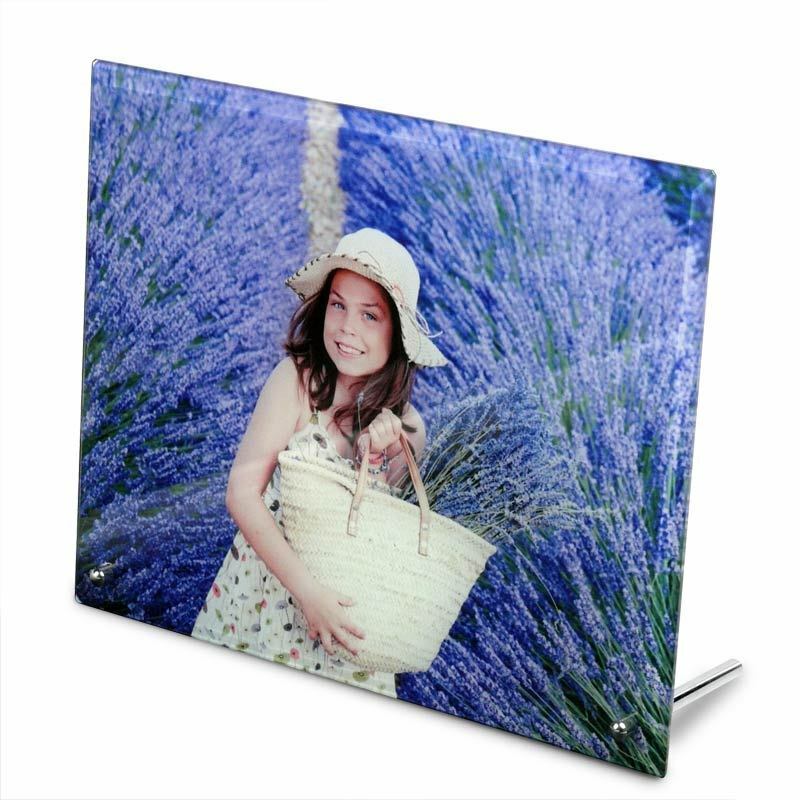 These printed glass blocks or panels are ideal for photo, design or even certificate printing. Whatever your image or design it can be printed into glass for striking display and longevity. This is a classic glass photo gift, and a great pleasure to make and provide. We'll send the glass prints in tough, safe mailing pack. The toughened glass is almost unbreakable in normal use. With a glass canvas rather than something more traditional, you can display your photographs with a modern elegance.